After one year we have evaluated our 7notes product and identified that the current pricing needs to be modified. Our development and production costs have increased and this regrettably means that we need to raise the price of 7notes. This price increase is something that we must do to provide new and existing customers with the quality of product they expect from MetaMoJi. The increase will take effect beginning November 26th. We will start alpha program for 7notes with limited number of testers before starting beta program. Android devices vary and we want to confirm 7notes work properly. Unique value of “android 7notes” , as oppose to iPad/iPhone one , is that it works as INPUT METHOD. 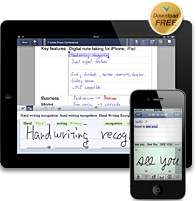 This means you can use “7notes mazec”, the state-of-the-art handwriting method , in twitter client , mailer , browser or any kind of android application. This alpha program is limited offer to someone related 7notes user , bloggers etc.